In the digital era, middle-aged men are no longer buying red sports cars and trying to dress young. They are investing in vanity drug programs, getting fit and doing triathlons, marathons and ironmans. Performance-enhancing drugs are the new solution for a midlife crisis. Every Thursday evening, four friends meet to play tennis. Each of them is in the throes of a midlife crisis, caused by the break-up of a marriage, work problems, growing insecurity, or low self-esteem. 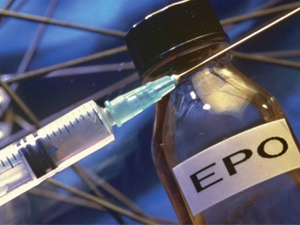 Nico believes the solution lies in vials and pills, and he starts using EPO, testosterone and human growth hormone. When his three friends see the changes that happen to him, they also want to get on the drug program. But one of the friends goes too far with the drug-taking, causing all of them to reassess what they’re doing and why. A story of friendship akin to The Full Monty and City Slickers, Epodemic is a funny, heartwarming story about middle-aged men who learn to accept who they are and become comfortable with growing old.